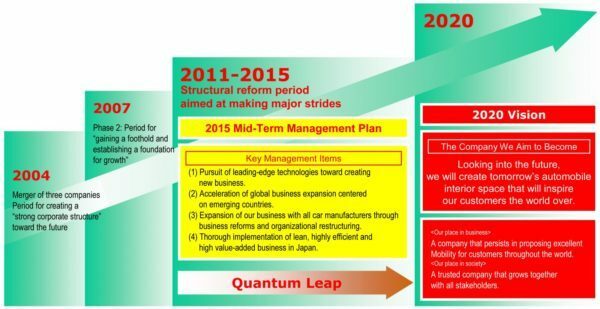 Kariya (Japan) 17th April 2012 – Toyota Boshoku Corporation (President Shuhei Toyoda) has instituted its long-term management vision “2020 Vision” and “Mid-term Management Plan until 2015” with the aim to achieve visionary goals by 2020. In order to achieve challenging management targets, each employee in the Toyota Boshoku group will strive to maintain a “Quantum Leap” mindset and tackle regional and functional issues. 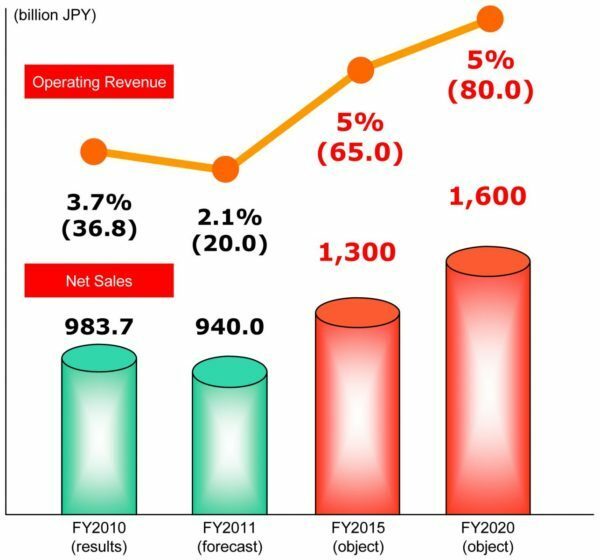 With the aim of becoming a world leading interior and filter maker, the Toyota Boshoku group positioned the period from our merger in October 2004 to fiscal 2006 as the “period for creating a strong corporate structure”, and fiscal 2007 to fiscal 2010 as the period of our “second founding”. During this time, we implemented an array of initiatives to strengthen our footing and established a foundation for a healthy long-term growth. We must move quickly to create a new structure that will strengthen our position as a leading global supplier in order to deal with increasing competition in emerging countries, shifts to move production overseas, and to maintain current businesses while providing new customers with products. (1) A company that persists in proposing excellent mobility for customers throughout the world. ◆ Readily provide products tailored to the various lifestyles of respective regions through innovative technologies that are unique to the Toyota Boshoku group and consistent in its manufacturing quality. ◆ Have an established presence in terms of unique value by creating innovative, next-generation products that exceed customers’ expectations. ◆ Strive to provide customers with environmentally friendly and enriched lifestyles by boldly pursuing inroads into new businesses. (2) A trusted company that grows together with all stakeholders. ◆ Resourceful and multi-talented human resources drawn by the appeal of the Toyota Boshoku group, with members working enthusiastically all regions, worldwide. ◆ Recognized as a company that is trusted and indispensable to society, customers, business partners and shareholders. ◆ Capable of carrying out unequalled monozukuri in every region of the world while carrying out kaizen continuously. Under the Mid-Term Management Plan, as the new stage following our “second founding” up to fiscal 2010, we have positioned fiscal 2011 through fiscal 2015 as a “period of structural reforms for making major strides” and we have established four main management issues and targets. (1) Pursuit of leading-edge technologies toward creating new business. Possessing better technological expertise than our competitors, we can expand our business scope and develop products optimized for each region. (2) Acceleration of global business expansion centered on emerging countries. Competition between suppliers will depend on producing and developing low-priced products that meet customer needs. (3) Expansion of our business with all car manufacturers through business reforms and organizational restructuring. Establish organizations to promote sales and develop products, with management and technology unified across all companies. (4) Thorough implementation of lean, highly efficient and high value-added business in Japan. As the core of a global company, pursue efficiency in model lines, develop and manufacture high-value added products. We aim to maintain our sales for Toyota Motor Corporation and achieve business expansion by acquiring new customers and projects. Accompanying this, we will expand overseas production starting with Europe and emerging countries.